One of the coldest days of the winter awaited our exhibitors and spectators at the Society’s annual show and sale held in Castle Douglas. Noted cattleman and recently appointed Galloway Cattle Society cow classifier Mr David Grant, 8 Netherhall, Bridge of Dee, Castle Douglas had the tough job of placing the bulls which was one of the best shows in recent years. David took his Champion from the 2 year old classes Ben Lomond Glengoyne from the Maxwell Family, Blairvockie Farm, Rowardennan, Drymen, a son of the very successful bull Klondyke Raider, which had been male champion at the 2013 Royal Highland Show and overall champion at the 2013 National Show. 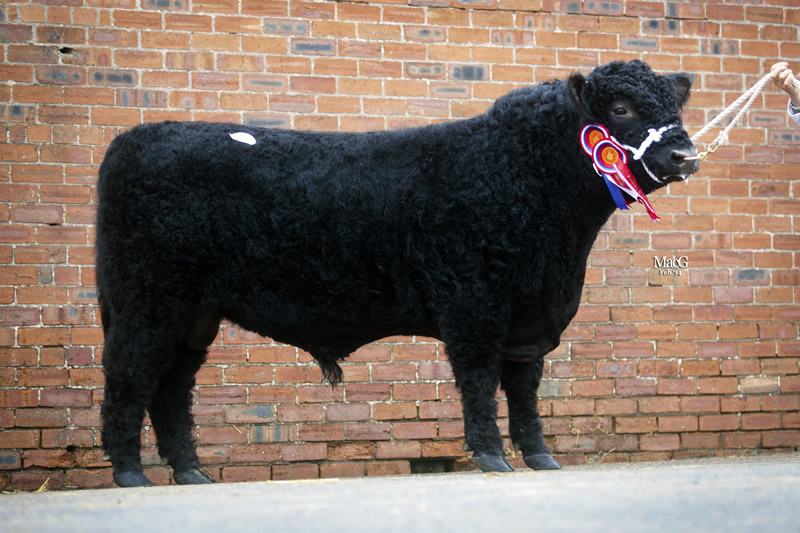 Glengoyne sold for 4000gns to John Heard, Hughslade, Okehampton, Devon he will join the 100 head Galloway herd. The reserve male champion was from a great line up from J & S Ross, Romesbeoch, Shawhead, Dumfries, Umpire of Romesbeoch is a Kirkmabreck Nimrod son and sold for 4000gns to Messrs Mastall from Germany who are returning to Scottish breeding after establishing their herd in the 80s. 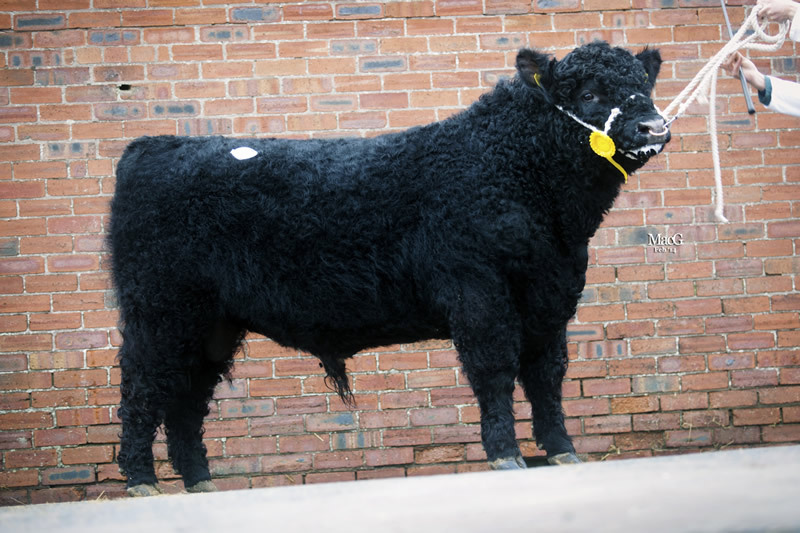 Top price of the day was for a second placed bull, Strictly of Fingland from Messrs W Wallace & Sons, Fingland, Dalry, Castle Douglas, this May 2012 born son of the well-known AI Sire Orinocho of Over Barskeoch sold for 5200gns and is off home with John and Andrew Tullie, Bowanhill, Teviothead, Hawick to join their pedigree and commercial herd. With 2 bulls and 11 heifers forward RA McClymont & Son, Kirkstead, Yarrow certainly had a great pay day, the two bulls, Kirkstead Unique and Kirkstead Umpire made 3800gns and 3000gns respectively, Unique a Penninghame Major son sold to returning buyer Jimmy Ions, High Thorneyburn, Falstone, Hexham and Umpire sold to new members Percy Farms, Emblehope, Tarset, Hexham, who are establishing both a pedigree and commercial herds. 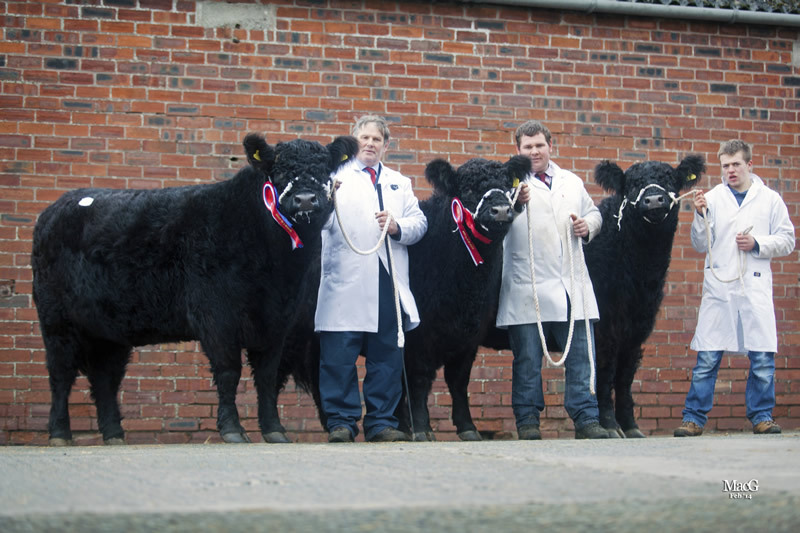 John, Ann and Iain Finlay, Blackcraig sold a pair of bulls, Blackcraig Ant and Dec for 2000gns and 3000gns , both Blackcraig Sid sons, Ant sold to Mr Davidson, East Deloraine, Ettrick, Selkirk and Dec sold to Troloss Farms, Elvanfoot, Biggar. 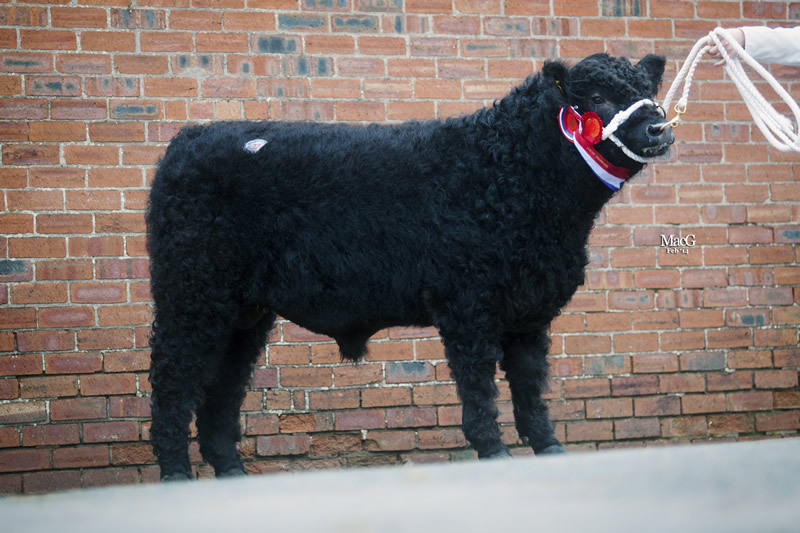 Stirling based Dennis and Margaret Gall sold the second youngest bull, Rannoch of Gall-way for 2600gns , this 11 month old Penninghame Major son was purchased by Marion Thomson and her husband from Nether Linkins, Gelston, Castle Douglas. 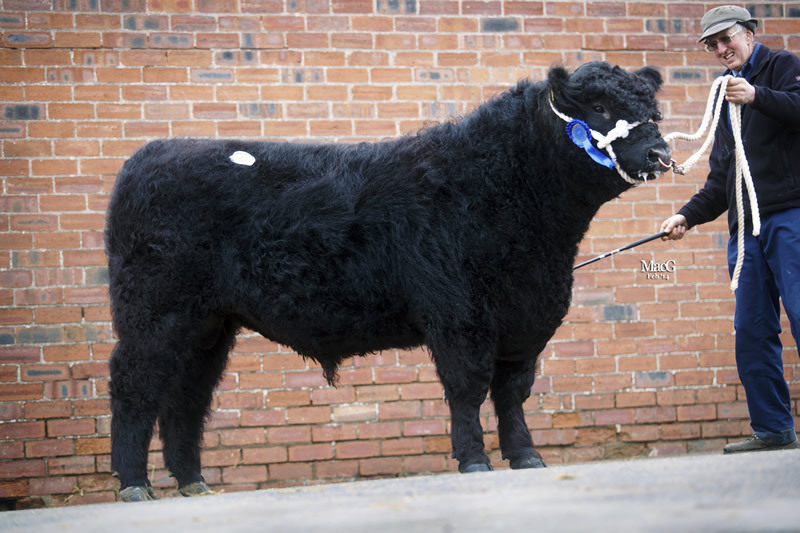 Isle of Man based John Teare, Ballavair sold the much talked about bull Ballavair Black Magic for 2500gns to female judge Mr David Cornthwaite and his wife Rosemary, Balgray Hill, Lockerbie, this 21 month old bull, is a son of Klondyke Power Play who was Junior Champion at 2009 Royal Highland show and Section Champion and Overall Supreme Champion at 2013 Royal Manx Show. 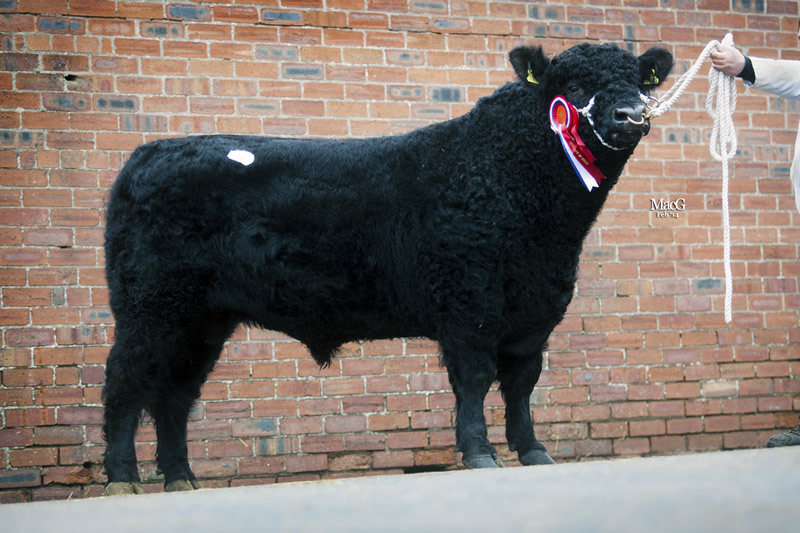 Another 3 bulls made 3000gns, Vivaldi of Over Barskeoch exhibited by Messrs Wallace, Over Barskeoch, Dalry sold to Mr Malcolm, Gribun, Hough, Isle of Tiree. Vivaldi has an impressive pedigree as his sire Thor of Over Barskeoch who was sold for 5000gns and is out of Nan of Over Barskeoch who was successfully shown winning over 20 champion titles. Unfortunately, the long journey home took three days longer due to the weather conditions. A member of the winner best pair of bulls V-Tech of Romesbeoch from the Ross Family sold to Messrs Gourlay, Craigmuie, Moniaive , Thornhill and Robert McTurk’s Barlaes Landmark, another Barack Obama of Fingland son sold to Devon based Messrs Jordan, Moortown Gate. New member and renowned Limousin breeder David Cornthwaite, Balgray Hill, Lockerbie was in charge of placing both the led and unled females, his champion in the led section was Lady Silverbell 8th of Gall-way from Margaret and Dennis Gall, Boquhan Home Farm, Kippen, Stirling and she went on to achieve the top price of 4100gns at the sale the following day, David backed up his decision by taking this very stylish incalf heifer home to his 24 head of Balgray Galloway herd. Silverbell 8th a Septimus of Tweedshaw daughter, she had been junior champion at the 2012 Royal Highland Show and has a very impressive pedigree with her dam and grand dam having been awarded supreme champion at the Royal Highland show. Margaret and Dennis also received 2700gns for Lady Silverbell 9th of Gall-way, this Penninghame Major daughter also went home with David and Rosemary Cornthwaite and again in the money for Lady Silverbell 10th of Gall-way who sold for 2200gns to J & S Ross, Romesbeoch, Shawhead. This Penninghame Major daughter has an impressive pedigree with championships on the dam side and going back to Lady Silverbell 12th of Corrie. The Ross family then sold Nerys 1341 of Romesbeoch for 2000gns, this Kirkmabreck Nimrod daughter and granddaughter of the famous show cow Doon of Urr Nerys 42nd is off home with new member, Messrs Ireland, Newhouse Farm, Drigg, Holmrook for their Newhouse herd which now stands at 25 head. 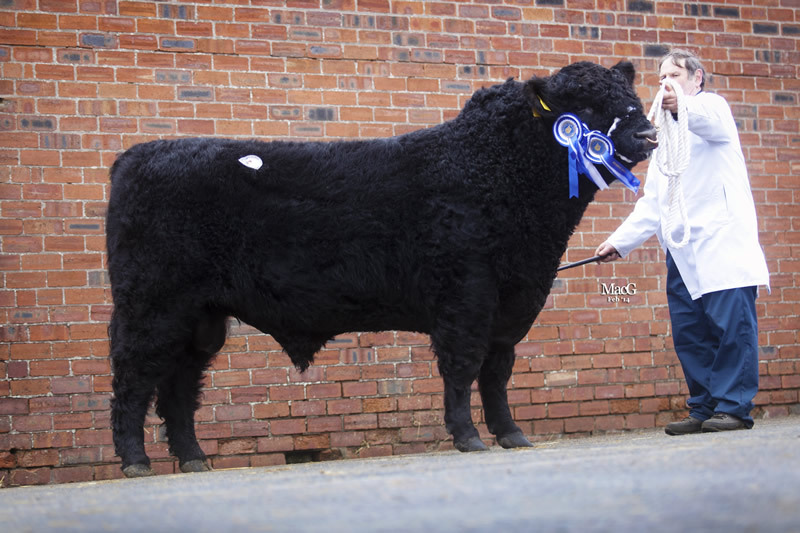 The Finlay Family also received 2700gns for Blackcraig Moss Rose T426, this Finmac Norseman daughter was purchased by young Willie McCornick, Barquhill, Newton Stewart for his herd which he established last year. The reserve female from J & A Finlay took the next best female price of 2600gns, another Finmac Norseman daughter Blackcraig Dora May T410 went home with Mr I Kennedy Moffat, Craigenvey, Moniaive again to join his herd he established last year. Both trophies in the unled section were won by RA McClymont and Son, Kirkstead, Yarrow, the best pair and winner of the Andros Perpetual Challenge Cup went to Kirkstead Moss Rose V5 and Kirkstead Nancy V18 , both Braveheart of Gall-way daughters sold to Mrs R Craig, Broomfield Lodge, Ayr.for 1600gns and 1800gns respectively. Winners of the McClymont/McIntosh memorial Trophy was Perlooie Pat 3rd bred by Mr J C Thomson and exhibited by Allan, this Kirkstead Nancy Boy daughter sold for 1350gns and made the long journey north to Islay with Mr Glover, Cladville. The 22 unled heifers averaged £1388. 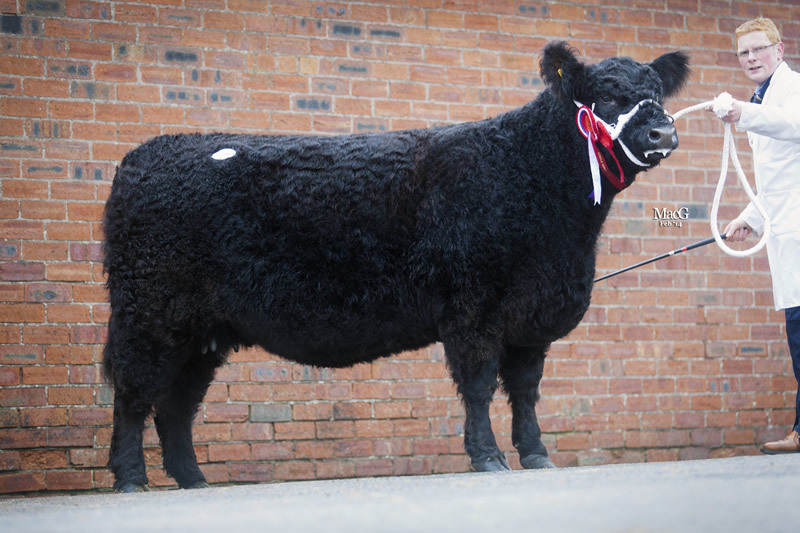 There were two steers exhibited from Kilntown Farms, Kilnstown, Bewcastle, Carlisle, the champion and top price was a very stylish April 2013 born steer sold to Mr A Paterson, Low Three Mark, Stoneykirk for 1500gns, Kilnstown’s other steer sold to M/s E Telfer & Son, Newton High House, Newton, Stocksfield, Northumberland for 900gns. Both steers will be shown at the summer shows. Also this day was the Bents dispersal on behalf of the Executors of the Late David Thomson. A total of 23 animals were forward, including the aged bull Blackcraig Oddity which made 1400gns to Mr W Glover, Islay. The top price female was for a dun cow, Lulu 362 of Bents, this Lochdochart Director daughter made 1550gns and was sold with a heifer calf at foot to A Lamont, Croish, Kilmouaig, Tiree. Two heifers incalf realised 1380gns , Daisy 484 and Daisy 485, both Blackcraig Oddity daughters sold to RHS Shaw, Gledpark, Borgue, Kirkcudbrightshire and Blackcraig Noreen 0244 returned to her breeders John and Ann Finlay for 1200gns. The young heifers sold well, to a top of 780gns for Polly 505 and Beauty 515 of Bents they went home with AM McIntyre, Dalchalloch, Pitlochry, Perthshire. 3 2500 M/s Jordan, Moortwon Gate, Gidleigh, Chagford, Devon.